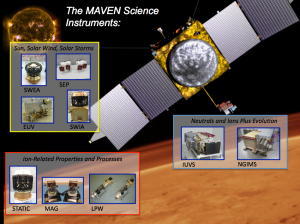 The Mars Atmosphere and Volatile Evolution (MAVEN) mission is designed to explore Mars’ upper atmosphere. It will determine the role that escape of gas from the atmosphere to space has played in changing the climate throughout the planet’s history. MAVEN was launched on November 18, 2013, and will go into orbit around Mars on the evening of Sept. 21, 2014 (10 p.m. EDT). Upcoming events in the next month include additional instrument testing and spacecraft calibrations, first testing of the Electra communications package that will be used to relay data from the rovers currently on the surface of Mars, and the second planned Trajectory Correction Maneuver. This maneuver will adjust the spacecraft’s path by a very small amount so that it will be positioned properly for the rocket-motor burn that will put it into orbit when it arrives at Mars. By 7 p.m. EST on Feb. 4, MAVEN will have traveled 136,949,317 miles (220,398,984 km). MAVEN will travel about 442 million miles (712 million km) on its path to Mars. MAVEN is currently traveling in its transfer orbit around the Sun at a speed of 69,480 mph or 31.06 km/sec. MAVEN’s principal investigator is based at the University of Colorado at Boulder’s Laboratory for Atmospheric and Space Physics. The university provided science instruments and leads science operations, and education and public outreach. NASA’s Goddard Space Flight Center manages the project and provided two of the science instruments for the mission. Lockheed Martin of Littleton, Colo., built the spacecraft and is responsible for mission operations. The University of California at Berkeley Space Sciences Laboratory provided science instruments for the mission. NASA’s Jet Propulsion Laboratory in Pasadena, Calif., provides navigation support, the Deep Space Network, and the Electra telecommunications relay hardware and operations. To read the original NASA release, please visit http://www.nasa.gov/content/goddard/maven-on-track-to-carry-out-its-science-mission.